A decorative three-storey Italianate hotel built for John and Josephine Anderson. Tenders were invited in February 1889 and the acceptance announced in the Australasian Builder and Contractor's News 30 March, 1889. 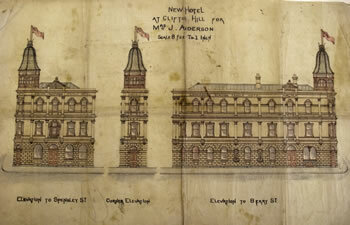 The architect was George Jobbins, and the original design as shown in the architectural drawings was to have included a corner tower, which would have made it an even more notable Clifton Hill landmark. 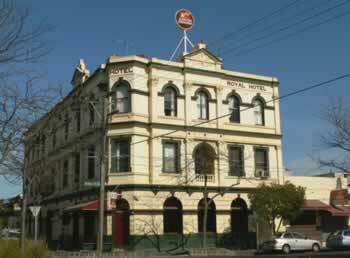 Since the demolition of the Earl of Zetland and Mac's Hotel, this is the only remaining three-storey hotel in Collingwood. The Andersons remained associated with the hotel for many years, while Mrs Anderson's siblings Ernest and Elizabeth Graham also served at the bar for decades. The Andersons quickly became active in the local community, especially Mr Anderson as a keen sportsman. He was elected president of the newly-formed Clifton Hill and Northcote Harriers, organised a committee in the hope of financing swimming baths on the Merri Creek, won the local pigeon shooting competition, and hosted smoke nights for the Clifton Hill and Northcote Cycling Club. Mrs Anderson died at the hotel in 1914, while Mr Anderson lived there until his death in 1938.